40 is the new 30. Except when it comes to your breasts. Age is just a number. This is a phrase commonly heard by women once they hit the big 4-0, and it’s true. People are living longer, and with the right lifestyle choices can stay just as healthy, fit, and young-looking as those who are decades younger. But staying active isn’t the only thing women 40 and over should be doing to stay healthy. One of the most important preventative things they can do for themselves is get a yearly mammogram. It’s no secret that breast cancer is one of the leading causes of cancer-related deaths for women in the U.S. The greatest defense is a great offense and that “offense” is early detection through breast cancer screening, typically with mammograms, once every year starting at age 40. The importance of this cannot be overstated: breast cancer death rates declined 36 percent from 1989 to 2012, largely as a result of screening mammography (American Cancer Society, Breast Cancer Facts & Figures 2015-2016). If 40 is the new 30, then why do you need to start screening for breast cancer so early? Plain and simple, mammograms save lives. Age is a non-modifiable risk factor for breast cancer. Although breast cancer risk is generally very low in women under 40, the risk that a woman might develop breast cancer in one year rises with age. The lifetime risk of developing breast cancer is approximately 12.5 percent (one out of eight women in the US will develop breast cancer in her lifetime). But the risk of death from breast cancer can be lessened if breast cancer is detected early with a mammogram. 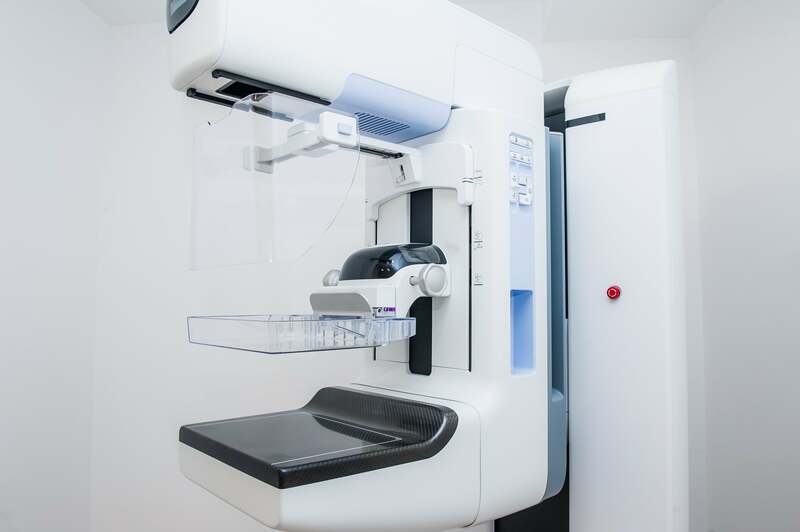 Mammograms use a low-dose of radiation to take x-ray images of the breast to detect cancer, often even in the early stages before women experience any symptoms. The earlier breast cancer is detected the better, because this is when the cancer is most treatable. Early detection may prevent the need for extensive treatment for advanced cancers or may decrease the need for a mastectomy — surgical removal of the breast(s). In fact, when breast cancer is detected early and is confined to the breast only, 5-year survival is approximately 99 percent. This declines to only 26 percent if the cancer has spread to other parts of the body at the time of diagnosis. Did you receive a letter after your recent mammogram telling you that you have dense breast tissue? If so, don’t panic. Dense breast tissue is common and is seen in 40 to 50 percent of women who get a mammogram. In Massachusetts, women with dense breasts must receive a letter informing them of this finding, even if no other abnormalities are found. While it is normal, women with dense breasts do have a slightly higher risk of breast cancer compared to women with less dense breast tissue. 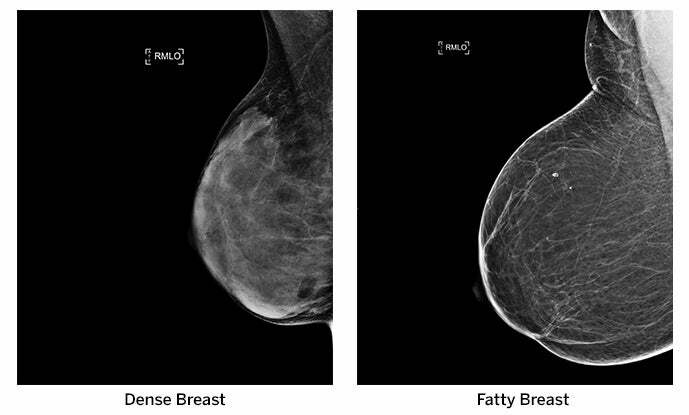 On a mammogram, the appearance of breast tissue ranges from fatty to dense. If a mammogram report describes a patient’s breast as being “dense,” it means there is more fibrous tissue (tissue that gives breasts size and shape) and glandular tissue (produces milk), than there is fat. Dense breast tissue, breast masses, and/or tumors all appear white on a mammogram. Fatty tissue looks black. On a black background, it’s easier to see a tumor that looks white. Because of the whiteness, dense breast tissue can make it more difficult for radiologists to see breast masses and tumors. If you have dense breasts, your provider may suggest additional screening. This may include use of 3D mammography (tomosynthesis) or a screening MRI of the breasts, a test that is especially sensitive for detection of breast cancer, even in women with dense breasts. It’s important to note that additional screening is possible and common in all women, not just those who have dense breasts. Your provider considers several risk factors such as family history and prior breast mammogram results before determining if you need additional screening. Women with a mother, sister, or daughter who was diagnosed with breast cancer are twice as likely to have breast cancer as women without a family history. If you have a family history of breast cancer, speak with your healthcare provider who may recommend more screening in addition to your standard mammogram. BRCA1 and BRCA2 are genes that produce proteins to suppress your body from cancerous tumors. When they don’t function correctly, cells are more likely to develop genetic alterations, which can lead to developing cancer. Specific mutations can be passed down from one generation to the next, increasing the risk of breast and ovarian cancers in women. These mutations can be passed down from the mother or father. The National Cancer Institute provides a complete overview of cancer risk for those with a mutated BRCA gene, and recommends who should receive genetic testing. Women who have the mutated BRCA gene have up to an 85% increased risk of developing breast cancer, making annual mammograms to detect cancer early even more vital and potentially life-saving for them. Pay attention to your breasts. Any abnormal bumps should be brought to your provider’s attention. The temporary discomfort of a mammogram exam is just that — temporary. Mammograms may seem scary, but breast cancer is scarier. Book your annual mammogram today at BMC or at your neighborhood health center BMC.org/mammo.